3 years & up. Engage minds and muscles! Hop down the river or use animal markers to learn colors, shapes, numbers and counting (1-10), problem-solving and how to follow simple directions. For individual, small-group or whole-class play. 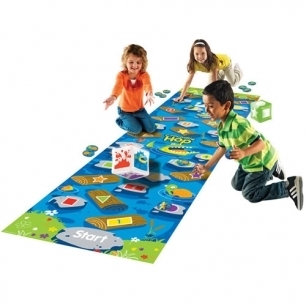 Includes colorful vinyl floor mat (100"L x 30"H), 2 inflatable cubes (5"), 40 animal markers and Activity Guide.